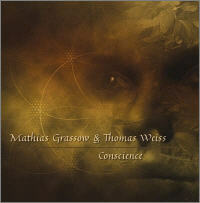 "Mathias Grassow, one of the main representatives of the continental ambient movement, with his friend Tomas Weiss have recorded an album dealing with the human conscience. This beautiful, intelligent record will be released on the Prague independent label Nextera. On his latest album, he has joined forces with Thomas Weiss to attempt a musical expression of the eternal topic of human conscience. Four long tracks leave space to freely morphing soundwaves, reflecting both positive spiritual power as well as somewhat murky moods. In the initial "Unsealed Enigma" with the almost palpable character of tide, Grassow and Weiss create the impression of absolute peace and harmony by mingling two main sound motifs (as though these were significantly discernable original sources of sound - the organs and the human voice). The next track, "Along the Border", is marked by inner unrest and its sinister athmosphere can be percieved as if both artists were to guide us to the war-torn areas of the Middle East. In "Foresight" (credits for sound to Klaus Wiese and Ted de Jong), one can distantly hear Grassow's rhythmic production (light rhythmical structures, oriental voices). All of what was mentioned then merges into a vast sound ocean in the final, half-an-hour track "Deceitful Expectation", definitely the most impenetrable and abstract track of the album. "The master of drone Mathias Grassow has done it again, this time with Tomas Weiss instead of Klaus Wiese. Regardless of whether he flies solo or teams up with others, Grassow has a knack for creating beautiful living breathing soundscapes out of seemingly nothing. “Unsealed Enigma” pulses steadily along, each sound element slowly expanding and contracting in a steady, completely mesmerizing way. His ability to pull the listener in and completely immerse you in the music is perhaps unsurpassed in the genre. After nearly 17 minutes of slowly undulating drones, “Along the Border” carries us along for 13 ½ more. Darker and more dramatic, the hypnotic effect remains much the same. This one really rumbles along. “Foresight” adds a slow deliberate beat which only adds to the meditation factor. Finally comes the piece de resistance, the 31-minute “Deceitful Expectation.” Full of warmth and depth, this is soooo peaceful. I defy anyone to sit back and really listen to this disc, or even this song, and stay awake through the whole thing – and I mean that as a compliment of the highest order. "While Mathias Grassow has been creating ambient music since about five years before he was born, Tomas Weiss is a "newcomer" to the ambient community. "Conscience", their first collaboration, is about as close to perfect ambient minimalism as it gets. Mathias has been the ultimate drone master for years and he continues to perfect his craft. This disc starts with a low drone that envelops listeners with its overtone qualities and subtle pitch changes. Mathias and Tomas build layers of atmospheres upon and from this drone. The atmospheres are gentle, cerebral and serene and they control the pace – slow, so slow as to approach standing still. That is the unique characteristic of this set. The music evolves slowly and deliberately. It seems to hang forever in listeners’ neuropathways as it triggers serotonin and neuroprenephrin activity. On the surface, the overtones have no substance or purpose. As they enter the biosonic feedback device (read: brain), they define themselves anew and allow listeners to float at will. For such a low-key soundscape, this CD evokes and promotes lots of activity – all of intangible and unquantifiable. While it might be impossible to dance to this music, it is just as impossible to prevent one’s insides from dancing to it. The music infects the mind, the heart, the spirit and the soul with its positive energy.